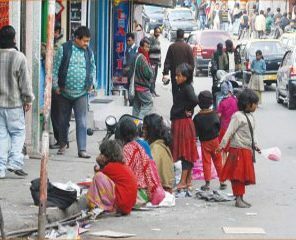 Shillong: The commercial hub of Police Bazar and its adjoining areas in the city have become the centre of operation for a large number of beggars. The number of beggars in the areas has been rising constantly leading to severe discontentment among the general people and shoppers who throng the areas. The beggars in their bid to take money from people go to the extent of pushing people or clinging onto their belongings. Voices have been raised time and again against the menace but to no avail. Tourists who flock to the city in large numbers to beat the summer heat elsewhere, are the ones who are often victimized by these beggars, mostly young children and sometimes even toddlers. Locals have been complaining that these beggars have become a huge embarrassment for the State. According to Lyngwa, the Board would soon sit with the district administration to chalk out certain strategies in order to remove the beggars from the city. Reacting to a query, the official, however, maintained that begging cannot be considered as illegal as long as they do not cause inconvenience to the public. It may be reminded that in 2009, the then Urban Affairs Minister Paul Lyngdoh had ordered a ban on entry of beggars in the city but till date herds of beggars are still operating in the city especially in the commercial areas of Police Bazar and Bara Bazar.